Raymond Wallace Bolger (January 10, 1904 – January 15, 1987) was an American film and television actor, vaudevillian, TV presenter, singer, dancer (particularly of tap) and stage performer (particularly musical theatre) who started in the silent film era. He was a major Broadway performer in the 1930s and beyond (see below). He is best known for his role as the Scarecrow and his Kansas counterpart farm worker "Hunk" in MGM's classic The Wizard of Oz (1939) and the villainous Barnaby in Walt Disney's musical fantasy Babes in Toyland. He was also the host of his eponymous television show, The Ray Bolger Show. Bolger was born in Dorchester, Massachusetts into a Roman Catholic family of Irish descent, the son of James Edward and Anne C. (née Wallace) Bolger. His entertainment aspirations evolved from the vaudeville shows of his youth. He began his career in a vaudeville tap show, creating the act "Sanford & Bolger" with his dance partner. In 1926, he danced at New York City's legendary Palace Theatre, the premier vaudeville theatre in the United States. His limber body and improvisational dance movement won him many leading roles on Broadway in the 1930s. Eventually, his career would also encompass film, television and nightclub work. In 1932 he was elected to the theater club, The Lambs. Bolger signed his first cinema contract with MGM in 1936, and although The Wizard of Oz was early in his film career, he appeared in other movies of note. His best known pre-Oz appearance was The Great Ziegfeld (1936), in which he portrayed himself. He also appeared in Sweethearts (1938), the first MGM film in Technicolor, starring Nelson Eddy, Jeanette MacDonald. He also appeared in the Eleanor Powell vehicle Rosalie (1937), which also starred Eddy and Morgan. Bolger's MGM contract stipulated that he would play any part the studio chose. However, he was unhappy when he was originally cast as the Tin Woodman in the studio's 1939 feature film adaptation of The Wizard of Oz. The role of the Scarecrow had already been assigned to another dancing studio contract player, Buddy Ebsen. In time, the roles were shuffled around. 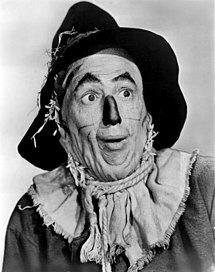 Bolger's face was permanently lined by wearing the Scarecrow's makeup. Following The Wizard of Oz, Bolger moved to RKO Pictures. In 1941, he was a featured act at the Paramount Theatre in New York, working with the Harry James Band. He would do tap dance routines, sometimes in a mock-challenge dance with the band's pianist, Al Lerner. One day during this period, the Japanese attacked Pearl Harbor, and Bolger's performance was interrupted by President Roosevelt's announcement of the news of the attack. Bolger toured in USO shows with Joe E. Lewis in the Pacific Theater during World War II, and was featured in the United Artists wartime film Stage Door Canteen. In 1946, he returned to MGM for a featured role in The Harvey Girls. Also that year, he recorded a children's album, The Churkendoose, featuring the story of a misfit fowl ("part chicken, turkey, duck, and goose") which teaches children that beauty is in the eye of the beholder and it "all depends on how you look at things". Bolger's Broadway credits included Life Begins at 8:40 (1934), On Your Toes (1936), By Jupiter (1942), All American (1962) and Where's Charley? (1948), for which he won the Tony Award for Best Performance by a Leading Actor in a Musical and in which he introduced "Once in Love with Amy", the song often connected with him. He repeated his stage role in the 1952 film version of the musical. Bolger appeared in his own ABC television sitcom with a variety show theme, Where's Raymond? (1953–1954), renamed the second year as The Ray Bolger Show (1954–55). He continued to star in several films, including Walt Disney's remake of Babes in Toyland (1961) and smaller cameos throughout the 1960s and 1970. Bolger made frequent guest appearances on television, including the episode "Rich Man, Poor Man" of the short-lived The Jean Arthur Show in 1966. In the 1970s, he had a recurring role as Fred Renfrew, the father of Shirley Partridge (Shirley Jones) on The Partridge Family, and appeared in Little House on the Prairie as Toby Noe and also guest starred on other television series such as Battlestar Galactica, Fantasy Island and The Love Boat. In the late 1970s, reaching back to his Irish roots, Bolger played in a commercial for Safeway Supermarket's "Scotch Buy" brand. It covered many products ranging from canned food to paper towels to beer and cigarettes. Bolger popularized the jingle, "Scotch Buy - taint fancy but it shore is good." His last television appearance was on Diff'rent Strokes in 1984, three years before his death. In his later years, he danced in a Dr Pepper television commercial, and in 1985, he and Liza Minnelli, the daughter of his Oz costar Judy Garland, starred in That's Dancing!, a film also written by Jack Haley, Jr., the son of Jack Haley, who portrayed the Tin Woodman in The Wizard of Oz. He was a Roman Catholic, and a member of the Good Shepherd Parish and the Catholic Motion Picture Guild in Beverly Hills, California. Bolger was a staunch Republican who campaigned for Richard Nixon in 1968. Bolger died of bladder cancer on January 15, 1987, in Los Angeles, five days after his 83rd birthday. He was interred at Holy Cross Cemetery, Culver City. He and his wife of over 57 years, Gwendolyn Rickard, had no children. At the time of his death, he was the last surviving main credited cast member of The Wizard of Oz. At Judy Garland's funeral, Bolger was the only one of her Oz costars to be present. He joined Harold Arlen, the composer of "Over the Rainbow", and his wife, Anya Taranda. They were reported as among the last remaining guests at the conclusion of the service. Whenever asked whether he received any residuals from telecasts of the 1939 classic, Bolger would reply: "No, just immortality. I'll settle for that." Bolger's Scarecrow is ranked among the "most beloved movie characters of all time" by AMC and the American Film Institute. For his contributions to the film industry, Bolger received a motion pictures star on the Hollywood Walk of Fame in 1960. It is located at 6788 Hollywood Boulevard. In 2019, the biography "More Than a Scarecrow" by Holly Van Leuven was published, the first comprehensive biography of Bolger. 1962 The Red Skelton Show Mayor Threadbare III Episode: "The Mayor of Central Park"
1966 The Jean Arthur Show Wealthy Man Episode: "Rich Man, Poor Man"
1971 Nanny and the Professor Uncle Horace Episode: "South Sea Island Sweetheart"
1978 Baretta Episode: "Just for Laughs"
1979 Battlestar Galactica Vector Episode: "Greetings from Earth"
1981 Aloha Paradise Harry Carr Episode: "Best of Friends/Success/Nine Karats"
^ a b c Fowler, Glenn (January 16, 1987). "Ray Bolger, Scarecrow in 'Oz' Dies". The New York Times. Retrieved June 5, 2008. ^ "Ray Bolger Biography". Filmreference.com. Retrieved September 18, 2012. ^ "About The Lambs". The Lambs, Inc. Retrieved March 8, 2018. ^ Harmetz, Aljean (October 1, 2013). The Making of The Wizard of Oz. Chicago Review Press. p. 169. ISBN 978-1613748350. ^ "Where's Raymond?, The Ray Bolger Show". ctva.biz. Retrieved March 14, 2011. ^ "6:06 JUDY GARLAND ON "WHAT'S MY LINE" tagcbs 17K views 5:04 Groucho Marx Roasts Johnny Carson Chantay Hyder 222K views 2:09 The Wizard Of Oz: Ray Bolger (Scarecrow) TheManThatGetsAway 69K views 2:14 Ray Bolger amazing elastic legs dance routine (1941) vintage video clips 47K views 3:00 JUDY GARLAND: DELETED SCARECROW DANCE WITH RAY BOLGER, THE WIZARD OF OZ 1939 Michele Bell 172K views 6:39 Stage Door Canteen- Ray Bolger sequence Dwight Mannsburden 19K views Safeway Supermarket Commercial feat. Bob Weir of the Grateful Dead - 1980s CoolOldVideos 24K views Entire Donny & Marie Osmond Show With Lucille Ball, Ray Bolger, Paul Lynde DavEvans066 28K views JOHNNY CARSON INTERVIEW ROBERT MITCHUM Jun 16 1978 Missy Logo 122K views Jack Benny Show with Groucho Marx VOA Television 7.3K views WORTH IT S4 • E8 $8 Toast Vs. $20 Toast BuzzFeedVideo 2.8M views New JOHNNY CARSON INTERVIEW ANTHONY QUINN May 18 1983 Missy Logo 28K views Judy Garland & Ray Bolger: Tea for two (The Judy Garland Show) TheManThatGetsAway 18K views Lee Grant on her career's brightest and darkest moments CBS Sunday Morning 26K views George Burns, Lucille Ball, Bea Arthur ◊ CBS On The Air ◊ 1978 fabtv 6.6K views Ray Bolger 1978 Safeway Scotch Buy Commercial". YouTube. Retrieved May 7, 2018. ^ Lucy E. Cross. "About Ray Bolger". Retrieved June 12, 2011. ^ Palm Springs Walk of Stars by date dedicated Archived October 13, 2012, at the Wayback Machine, palmspringswalkofstars.com; accessed September 26, 2014. ^ "Our History". Church of the Good Shepherd. Retrieved September 26, 2014. ^ ""1968 Presidential Race" Republicans". The Pop History Dig. Retrieved March 8, 2018. ^ Adelman, Gary (2008). "Ray Bolger in The Wizard of Oz as the Scarecrow". Kansas Wizard of Oz 'N More. Retrieved June 5, 2008. ^ "Ray Bolger". The Official Masterworks Broadway Site. Retrieved March 8, 2018. ^ Van Gelder, Lawrence (June 28, 1969). "Judy Garland's Funeral Draws Her Colleagues". The New York Times. Retrieved April 2, 2017. ^ Albright, Jane (2008). "Return to Oz & 50th Anniversary of MGM Film". The Oz Reference Library. Archived from the original on April 19, 2008. Retrieved June 5, 2008. ^ "Greatest Movie Characters". www.filmsite.org. Retrieved August 20, 2017. ^ "AFI: 10 Top 10". www.afi.com. Retrieved August 20, 2017. ^ "Hollywood Walk of Fame - Ray Bolger". walkoffame.com. Hollywood Chamber of Commerce. Retrieved November 29, 2017. 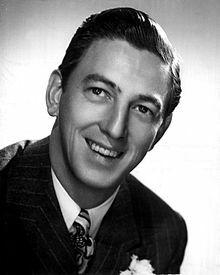 Wikimedia Commons has media related to Ray Bolger. John Joseph Haley Jr was an American vaudevillian, actor, radio host, comedian, singer and dancer best known for his portrayal of the Tin Man and his farmhand counterpart "Hickory" in the classic 1939 MGM film The Wizard of Oz. That's Entertainment! III is a 1994 American documentary film released by Metro-Goldwyn-Mayer to celebrate the studio's 70th anniversary. It was the third in a series of retrospectives that began with the first That's Entertainment! (1974) and That's Entertainment, Part II (1976). Although posters and home video versions use the title without an exclamation mark, the actual on-screen title of the film uses it. The Harvey Girls is a 1946 American musical film produced by Metro-Goldwyn-Mayer based on the 1942 novel of the same name by Samuel Hopkins Adams, about Fred Harvey's famous Harvey House waitresses. Directed by George Sidney, the film stars Judy Garland and features John Hodiak, Ray Bolger, and Angela Lansbury, as well as Preston Foster, Virginia O'Brien, Kenny Baker, Marjorie Main and Chill Wills. Future star Cyd Charisse appears in her first film speaking role on film. Broadway Melody of 1938 is a 1937 American musical film produced by Metro-Goldwyn-Mayer and directed by Roy Del Ruth. The film is essentially a backstage musical revue, featuring high-budget sets and cinematography in the MGM musical tradition. The film stars Eleanor Powell and Robert Taylor and features Buddy Ebsen, George Murphy, Judy Garland, Sophie Tucker, Raymond Walburn, Robert Benchley and Binnie Barnes. Babes in Arms is the 1939 American film version of the 1937 Broadway musical of the same name. The film version stars Mickey Rooney and Judy Garland, and features Charles Winninger, Guy Kibbee, June Preisser, Grace Hayes and Betty Jaynes. The film concerns a group of youngsters trying to put on a show to prove their vaudevillian parents wrong and make it to Broadway. The original Broadway script was significantly revamped, restructured, and rewritten to accommodate Hollywood's needs.